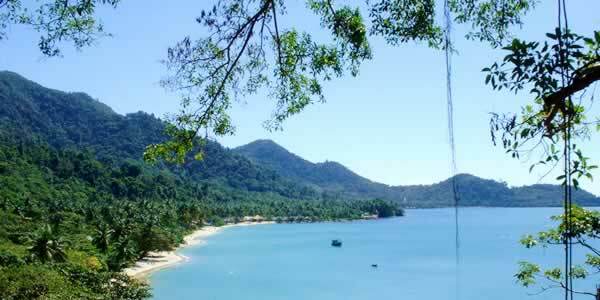 Virtual Travel & Island Guide about the Beaches and Bays on Ko Chang in Thailand. www.KoChangVR.com - Virtual Reality (VR), Panorama Pictures, Photos and Information. Your Browser can't show embedded Frames: You can't see the pages of the beaches on Ko Chang. Please use the navigation on the left to go to these pages! On Ko Chang there is a multitude of beautiful beaches, most with hotels and bungalow resorts, some of them still untouched and lonely. The 6 main beaches of Ko Chang, White Sand Beach, Pearl Beach, Klong Prao Beach, Kai Bae Beach, Lonely Beach and Bai Lan Beach are all on the west coast. In addition, the fishermen village Baan Bang Bao and the beach behind, Klong Kloi Beach and Wai Chek Beach in the southwest of Ko Chang and also the whole, still almost "tourist free" east coast of Ko Chang, are worth a visit. And its not only the charming beaches but all the many still almost unspoiled villages and the bays like the big beautiful Salak Phet Bay with the Long Beach in the southeast and Salak Khok Bay on the east coast with the best preserved mangrove forest on Ko Chang are worth seeing. We present the most beautiful locations with virtual reality, panorama pictures, photos, descriptions and helpful information. We still want to point out the difference in the water level between winter and summer. Because of the reefs in front of Ko Chang and the surrounding islands almost all beaches are relatively flat. In winter at high tide the sea almost reaches the bungalows at many hotels and resorts – in summer at low tide the beaches can be 100 meters or more wide. Here a few pictures of the beaches and bays on Ko Chang: To enlarge click on the pictures (popup window: 600 x 300 pixel). To go directly to the pages of the beaches or bays, click on the names. We point out, that in rainy-season between May and October, at some beaches strong currents may occur! Since people drowned already, we ask you not to ignore the warning-signs!